Thoughtfully designed to have significant impact at every level of the guest experience. Built with busy hotel pros in mind, everyone can get involved minus the hassle. 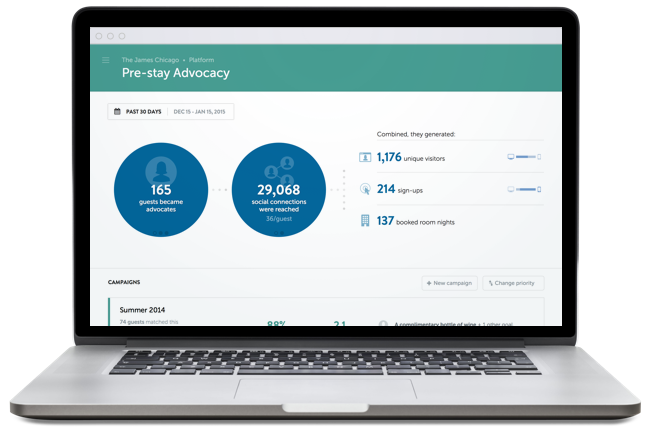 Most hotels are live in days to a few weeks with the help of our advocacy experts. Turn the excitement of booking a trip into a message with worldwide reach. A reimagined post-stay interaction that builds the strongest brand connections possible. Let your guests share their fondest memories, and tap into the creativity and unique perspectives that only your guests can provide. Add personality and give site visitors a compelling incentive to book direct. When your guests help your hotel tell a richer story to the world, there’s little effort required for big results. Our account makes it incredibly easy to understand the global impact of your advocates - individually and combined - and has everything you need to help make it even bigger. It’s incredibly easy to go live thanks to a well-designed platform and a talented, friendly support team. Most hotels are live within days to a few weeks. What's the best next step for you? Provide a little bit of info so we start down the path of working together. Are you currently a Flip.to customer? We hope you’re as excited to talk about advocacy as we are. We’ll be in touch soon. We'll drive in a full platform demo and answer any questions. We’ll send your very own link to see the impact and how it’s done. Share or reach out when you’re ready. We’ll set up time to chat about your goals and answer any questions. You can even invite friends and colleagues. We book over 100 reservations per month on our website. Our average daily rate (ADR) is greater than $65.